The most thorough and comprehensive Van Gogh resource on the Internet. The artist's life and times, exhibitions and the Museum's collection. Art and travel book "Van Gogh walks Paris". Gallery offer original impressionist paintings by contemporary Eastern European and Russian colour oriented representational artists. They are influenced by the Impressionist and Fauve styles, all of which remain more popular and inspiring styles of fine art. Association of professional impressionist painters offer a big and excellent collection of original oil paintings for sale and for pleasure. Order online, free delivery. ART HIT - original oil paintings. Original oil paintings and drawings for sale by contemporary artists. Surrealism. Abstract art. Impressionism. Landscape art. Oil Painting Gallery, original oil painting on canvas and frames paintings, animal art, landscape painting and roman art. landscape art Painting Portraits and custom made FREE SHIPPING. Paintings for sale art gallery - original paintings, watercolor drawings and other arts for sale by famous and modern artists. We offers most advantageous terms of purchasing artworks online. Our exposition of paintings for sale is continuously expanded and regularly renewed. Fine art pictures with the most amazing landscape art, new york art, art gallery and huge collection of oil paintings, paintings are any size and any frame for your chose At Favorite Paintings. Fine art pictures with the most amazing landscape art, new york art, art gallery and huge collection of oil paintings, paintings are any size and any frame for your chose At Favorite PaintingsOil Paintings - Discount art,famous paintings masterpieces,Wholesale oil paintings direct from the artists.Over 9500 paintings in our online art gallery. Art gallery with watercolors from the flora and fauna, free graphics, E-cards and photos. Turn your photos into beautiful paintings. All our work is 100% handmade by professional artists. From 79$ only. The perfect gift for your loved ones. Art Gallery featuring Picasso, Chagall, Miro, Dali, Leger, Braque, Matisse, Dufy, Calder and Lindner Paintings and Hand Signed Lithographs. Isabel® supplies high quality fine art reproduction oil paintings of Masterpieces: Van Gogh, Monet, Renoir, Cezanne, Degas, Manet, Botticelli, Gauguin, & more ... Secure Order. Stop4art.com - fine arts virtual gallery. Fine art gallery of beautiful original modern, contemporary paintings, mastered by one of the most prolific artists in Illinois. Oil painting reproduction art done totally by hand & original Asian artwork. Money-back guarantee. Free courier delivery. Frames. Any artist. Any painting. Any size. Limited edition prints & custom picture framing. Offers pen and ink portraits of classic movie stars, music legends and sports superstars. Visitors to our site can also order beautiful oil portraits of family and pets. Original oil paintings, watercolors and limited edition prints of Scottish golf courses, castles and landscapes and some rare Scottish and Celtic artefacts ideal for corporate or personal gifts. Free online art gallery helps artists to create online art galleries. You can upload, change and delete images of your artwork at any time using just a web browser. Buy, sell artwork online. Try our free package. We support multiple languages. Contemporary paintings for sale - art dealers in oil paintings, watercolours and pastels since 1975. McDougall Fine Art Galleries specializes in American paintings and watercolors of the 19th and early 20th century. Over 40 years experience in marine paintings and nautical artifacts. Paintings for sale art gallery offers you remarkable drawings, sculpture and paintings for sale. http://www.artgallery.com.ua - original and affordable paintings for your collection or home design. Lugansk Art Gallery - the cheapest and easiest way to buy paintings online. A lot of artworks in different styles and media. Website offers a wide variety of features and services that enable customers to buy and sell their art. Artery Gallery is a Scottish art gallery based in Crieff, Perthshire central Scotland and is aiming to make art more affordable by offering you the best in Scottish and European contemporary art. Offering world famous oil painting reproductions. Be prepared to be excited with are online art displays. We specialize in original sculptures and paintings of wildlife, abstract and human figures. New pieces are is being added weekly. Start adding to your art collection by visiting us often. Commissions are also available. ArtLex is a dictionary of art for everyone interested in art production, collection, or history. You will find articles on thousands of art terms, along with terrific images, pronunciation notes, great quotations, and links to other resources on the Web. Comprehensive directory and searchable database of art resources on the Web covers artists, animation, art galleries and museums, architecture guides, crafts, photography, digital art, etc. Offering oil paintings, watercolors, Chinese paintings. The complete A to Z of art resources! Register your original art at the Fine Arts Title Registry and add value, security and prestige. If it is worth framing, it is worth registering. is dedicated for those who have any interest in art. Artonline4u provides coordinated information about art resources as artists and galleries, and their activities. Talented Russian artist offers oil on Board paintings. Artist focuses on using pure colours in a direct and exquisite manner. His palette is sparkling, his strokes are expressive and dynamic, and from each of his paintings one can feel the inner vibration of joy and love for life. Visit the gallery of original stained glass mosaic mandalas of American artist David Chidgey and grace your home or office. Experience the Light! 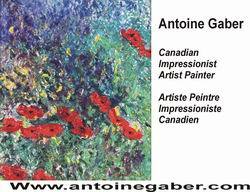 Antoine Gaber, Canadian contemporary impressionist artist painter. The beginning of the millennium heralds great recognition for the artist as his work becomes increasingly known in Canada, USA and sought after in Europe. An increasing presence on the world's artistic stage is indicative of the piercing vision that guides and shapes Gaber's ever-evolving oeuvre. Original Oil Paintings by the Contemporary Italian Painter Silvana Brunotti. Pictures of Rome, Italy Landscapes, Still life painting, Watercolors and mixed techiniques. Online art studio and gallery of realism artist Teresa Bernard � original oil paintings for sale; landscapes, seascapes, wildlife, still life, floral and religious art. Including free art lessons. Abstract, metaphysical art galleries on sacred geometry, nature, and art's spiritual relationship to cosmic creation. View how sketches, preparatory drawings & paintings are developed from initial field encounters. 3D collaborations with nature on stone & cypress knee, as well as signed originals on canvas & paper, monthly animal news & more. Contemporary impressionist fine art oil paintings. Portraits, still lifes, landscapes. Realist oil paintings, fine art and classical realism by contemporary realist artist. Vibrant, expressionistic oil paintings by Canadian artist Martina Shapiro. Fine art photography of black and white and color abstract flowers, digital photos, and creative travel pictures of Cuba and Greece. On-line gallery of Wisconsin artist includes exhibitions of florals, landscapes, gardens, seascapes, and lighthouses. Original fine arts of oil paintings of nature by Lithuanian artist Marina Kharma. Cybergallery of contemporary impressionist artist Karen Burnette Garner. American landscapes and seascapes a specialty. Anthropomorphic perception demonstrates artist's cultivated ability to perceive hitherto unseen alternate realities within any image that he behold. Offering traditional fine art oil and watercolor paintings of landscape, portrait, and romantic figurative subjects. Commissions welcomed. In the tradition of the French and American Impressionists, lanscape painter Tracey Frugoli paints light in the open air. Her site includes artwork, articles, resources and links, plein air painters group forming, and other features. Online art gallery featuring plein air paintings and contemporary impressionist oil landscape paintings of California. The paintings included on this website correspond with the artist's direction during the past fifteen years. Original fine art and art instruction. Original fine art is that is relaxing, playful and inspiring. Fine art gallery of impressionism and realism original oil on canvas. Original paintings, prints and posters by Canadian artist Rich Thistle. Secure online catalog ordering. Fine art painter offer New Mexico landscape. Original paintings of wildlife, nature art, lanscapes, and pet portraits. In her impressionist oil paintings, the artist Anna Ravliuc, reveals a highly emotional approach to her main subjects - flowers and horses. The flower is the symbol of love and desire. The horse, of virility and power. Paintings for sale by Australian artist Fred Marsh. Features a wide range of landscapes, still lifes, flowers, and figurative work. Impressionist oil paintings of the landscapes, architecture, and people of the Southwestern United States, done both "in plein air" and in the studio. New Zealand artist, Graham Braddock presents a selection of art prints and fine art posters, selected from a range of his original oil paintings. Portrait, landscape, and still life artist specializing in commission portrait paintings throughout North America. Suburban landscapes painted in alkyds depicting the often overlooked beauty of ordinary neighborhoods. Texas artist landscape painting the west and Holy Land landscapes in pastels & oils and casting western bronzes. An online gallery of fine art oil paintings featuring Western, Native American, Wildlife, and Visionary themes. Internationally exhibited watercolorist Nan Rae is a Chinese Brush painter with Impressionist influence. Her web site features lessons, prints and cards. View contemporary impressionist and abstract landscape art by California artist, Patricia Wagner. Free art lessons are included. Original oil paintings by Michigan artist Karen Challender. Landscapes, seascapes and snowscapes in vibrant colors to match any decor. Leif Nilsson Spring street studio and gallery. Fine contemporary Connecticut impressionist artist's studio and gallery. Oil paintings and drawings including portraits, landscapes, and nudes in the impressionism style. Livsey has undertaken projects based on still life, portraiture and the portrayal of the Human form in everyday life. livsey's paintings are inspired by the people that he meets going about their everyday lives. Fine Art with European exotic themes by Jonatas Chimen. Wide selection of superb realistic paintings of venetian masks, musical instruments and more. Bas-relief & egg tempera original paintings by Linda Paul. Limited edition prints on canvas of Italian art & French country. Kitchen canvas prints! Contemporary art pictures of Italy & France: arches & architecture, impressionist landscapes, flowers & gardens, wine still life, southwestern chili peppers & ballet paintings & art prints for sale. Mona Youssef is a professional Canadian artist involved in realistic oil paintings. One of her achievements is the well known Canadian Constitution Act painting. Annabel Greenhalgh is one of the foremost pastel landscape artists working in Britain. Daphna Shmuely, Israeli Artist, makes unique handcrafted jewelry from antique silver plated cutlery, spoons and forks. Tatiana E. Pouzanova-Galatch is designer, painter, graphic artist born in Saint Petersburg and living in Budapest. One of the UK�s leading Botanical Artists specialising in detailed pencil and coloured pencil drawings, available as limited edition prints and greeting cards through her online shop. Clean lines and lively color are the driving force of Sonja Harper's abstracts. Her fun, playful shapes restlessly interact with eachother and her compositions are always bursting with movement and positive energy. Original oil paintings on canvas by Russian artist Pavel Kalugin. Landscapes of Siberia. Animals. Portraits. A still-life. Paintings for sale. Photogallery. Finely crafted works of art by Geoffrey Williams. These exquisite pieces show true depth of artistic talent and are available for your pleasure. Stop by our gallery and make one of these timeless classics yours today. Abstract oil paintings exploring inner states of mind through emotive colour, expressionist form and a "tortured" surface texture. Presents the artworks of the Lebanese and French artist painter and poet Joseph Matar. The site displays oils paintings, watercolors, poetic verses, postcards, art prints reproductions. Patricia A. Timbrook - As a contemporary painter, I enjoy working out my compositions with acrylics on canvas, although occasionally I shift to arranging found objects on canvas. Abstract art originals and limited edition prints by emerging abstract artist Van Renselar. Artworks for home interiors and corporate spaces. Todays premier art directory and artist resource guide featuring multiple categories and free listings for artists, craftspeople, galleries. Art network publishes art marketing books and teachs fine artists how to market their art work. Free online auction marketplace. Buy or sell almost anything. Articles, lessons, and tips on watercolor, oil painting, acrylic painting, pastels, crafts and more. Antique Alive Gallery - Presents Korean antique treasures, works of art, handicrafts and art essays in various art forms such as mother of pearl, celadon, white pottery, paper fans, ramie fabrics, antique furniture. Art Materials, Gallery, Crafts and Cardmaking from Studio Arts Shop Lancaster featuring artists materials with information on new products, special offers and art resources. Providing business logo design that establishes clear image. Interiors art and design directory top listings of all companies in the art and design world, from interior designers to photography, artists and much more. Beautiful gourmet gift baskets for every occasion including Christmas, Mother's Day, Father's Day, Easter, Birthdays, Corporate, Get Well, and more. All our gift baskets come with free ground shipping. Digital photo service. Professional photo restoration,photo manipulations, photo montage and collage, pop art, artistictreatment, 'cosmetic surgery', glamorization, coloring, photo gifts. Visit the impressionist oil paintings of Russian painter Vitali Komarov. Art inspired by Van Gogh include landscape, portrait and still life of flowers and fruits. Order online, free shipping.